commented on "Fender Humbuckers that WILL FIT our 2 hole humbucker pickguard mount: ..."
* If your humbucker uses 3 screws (2 left, 1 right) it has a centre hole both sides, and will fit a vintage style 2 hole guard mount. 1. Wide Range Humbucker Vintage (4 SCREWS) Bridge & Neck - 2 holes both sides, no centre hole for 2 hole guard mount. Unless you drill a centre hole in both sides of the mounting feet. * If the humbucker uses 4 screws mounts (2 screws both sides) there is no centre screw hole. This will not fit 2 hole guard mounts. 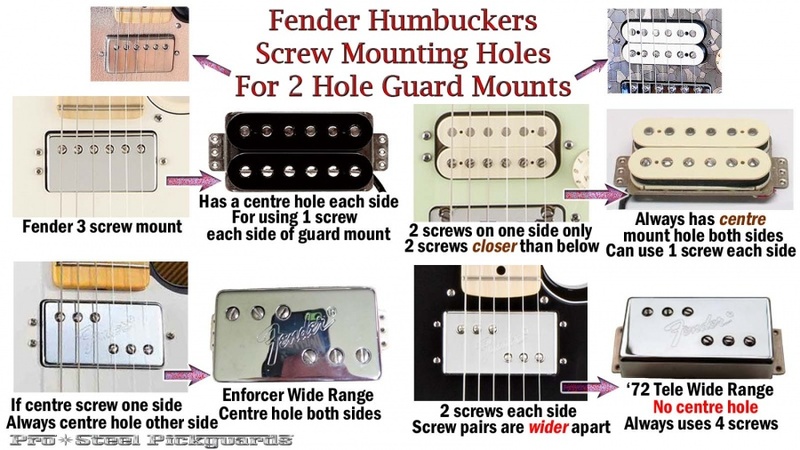 Most Fender humbuckers actually have a centre mounting hole on both sides, under the guard. Suitable for a 2 hole humbucker guard mount. So you can use your Fender Humbucker with other non-Fender pickguards made for vintage style 2 hole humbucker mounts. Only the 4 screw Fender Wide Range Humbucker found on the '72 Deluxe Telecaster, and Classic Player Deluxe Tele, does not have centre mounting holes and will not fit the 2 hole guard mount. Unless you drill centre holes. I hope this has helped some players, knowing you now have some flexible choices of pickups and pickguards.